Exactly what is it that convinces a Windows 7 user to drop the Web browser that came with her operating system - Internet Explorer - and try one of its many free competitors? The very name "Firefox" implies both speed and savvy, two factors its predecessor - Netscape Navigator - did not always possess. "Faster" and "better looking" are the two factors that make folks trade up for a sports car, though with a Web browser, "free" is a nice incentive you don't find in the automotive market. Last month, Microsoft demonstrated that it is indeed capable of robbing Firefox of all its persuasion points, with a public beta of IE9 that is faster and smoother than anything Mozilla has ever produced. If IE9 is already fast, simple enough to use, and even good looking, the incentive for consumers to try not just Firefox but any other alternative, could evaporate. 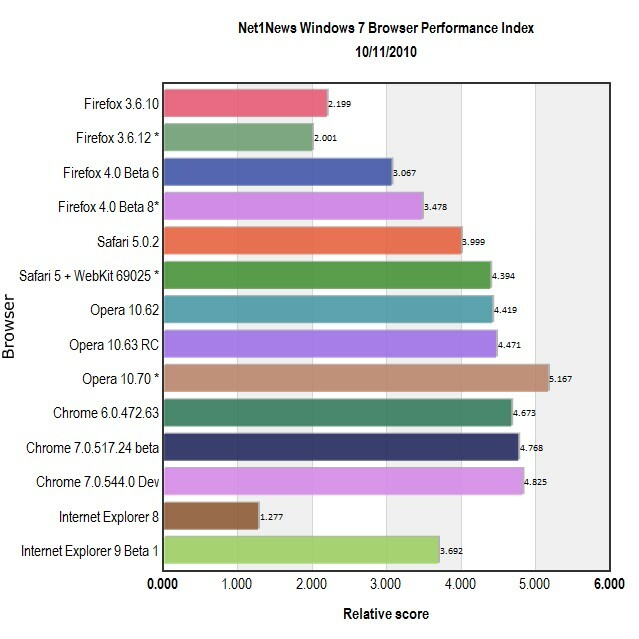 In the most recent browser performance tests conducted by Ingenus LLC on October 8, Mozilla's public beta of Firefox 4.0 Beta 6 continues to lag behind Microsoft's public beta of Internet Explorer 9 by 20% overall. Using the performance of the 2008 model Firefox 3.0.19 as an index (1.000), Mozilla's current stable Firefox 3.6.10 release scores a 2.199 overall, representing better than twice the performance of its predecessor. Firefox 4.0 Beta 6 scores a 3.067 on the same tests; and it should be worth noting that the ability for any mechanical product to gain about 100% performance per year is an extraordinary achievement. But in a field of extraordinary players, this milestone could get lost in the shadows. IE9 scores a 3.692 on the same suite of tests, catapulting itself over IE8's score of 1.277 and making room for itself as a true contender. Being just a contender - just capable enough to fight the battle - may be all Microsoft needs to win this war. While not everyone seriously cares about the performance of his Web browser or his refrigerator or his lawnmower, in recent months, the number of folks who do care has grown. Historically, it's the non-caring group that has represented Microsoft's base; in fact, this year the single loudest evangelist preaching the virtues of kicking off the mortal, rotten coil that is IE version 6, has been Microsoft itself, going so far last March as to send flowers to a mock IE6 funeral. For the other group, the urge to use Anything But Microsoft remains strong, including for office workers who feel stuck with Windows every day. That urge has sustained Mozilla's core customer base up to now. But Mozilla's place as the standard bearer for alternatives is now under concerted attack by all three non-Microsoft rivals, with the smallest of them all carrying the biggest guns to the fight. An exhaustive battery of tests on the latest developers' snapshot of Opera Software's latest 10.7 reveals a browser better suited for running modern Web applications than even Google's fastest developers' build of Chrome. Last Friday, that snapshot build scored a colossal 5.167 overall, toppling both the 4.419 score posted by the current stable Opera 10.62, and Google Chrome's fastest score: the 4.825 posted by development build 7.0.544.0. Four years ago, Opera Software lit the fuse that sparked the whole "speed is good" argument in the Web browser field. But Mozilla, Google, and Apple all answered back, leaving Opera behind as an also-ran, even fueling speculation that Opera could just simply quit. IndyCar fans will appreciate this analogy: If Firefox 3.5 was Danica Patrick, Opera 9 was Milka Duno. For its latest tests, Ingenus re-engineered the open source SlickSpeed selectors test to account for the newest versions of JS libraries, and also to give each one more of a workout. The new test battery, which you can see and try for yourself on this page, gauges the amount of time it takes for a browser to process 64 different standard CSS3 selectors, both natively and with the aid of the most recent versions of ten different libraries including jQuery, the popular MooTools, and the latest build of selector engine Sizzle by jQuery creator John Resig. Opera 10.7's SlickSpeed scores are nothing short of astonishing. Here's the full scale of it in a nutshell: Not long ago, the average CSS3 selector took the jQuery library about 250 ms to execute. When Microsoft unexpectedly threw its support behind jQuery, it improved IE8's performance with that library to approach par for the course. Now IE8 executes a selector with jQuery 1.4.2 in 228.72 ms. Firefox 3.0.19 (the index browser) takes 171.9 ms on average, and Firefox 3.6.10 accelerates that speed all the way to 39.83 ms. Throwing down the gauntlet, Google Chrome's performance with jQuery of late has seen posted times of between 11 and 12 ms, which just last month would be called astonishing. Opera 10.62 performs well at 20.34 ms, but well behind even Apple Safari 5.0.2 at 16.02 ms. Here's where Opera 10.7 picks up the gauntlet and throws it overboard, posting an average time of 3.69 ms on average. Other libraries also share in Opera's switch from impulse to warp drive: Sencha's Ext 3.2.1 JS library performance boosts from 20.66 ms (10.62) to 2.98 ms (10.7); NWMatcher 1.2.2 performance surges from 19.79 ms (10.62) to 3.61 ms (10.7); and Resig's Sizzle library finds its powder keg, blasting from 19.4 ms (10.62) to 3.1 ms (10.7). It's surges like these that lead to Opera 10.7's unbelievable relative score of 20.407 on the new SlickSpeed battery, compared to its nearest rival, the latest stable Google Chrome 6.0.472.63 with 8.822. The latest daily development build of Firefox 4 Beta 8 (less stable than the "public" Beta 6, though still openly downloadable) manages only 3.353 on this same battery. This article originally appeared in Net1News.